As a slight diversion from all things 213, I thought it might be fun to tell you about buses in Newcastle. The Dinnington bus is run by Arriva. It used to be a 45, but now it’s a 44 or a 44A. It used to run every quarter of an hour, going to half hourly after 7pm. Now it’s half hourly, with one an hour after 7pm. This isn’t good. It also costs £2.20 for a single trip from where I lived to Dinningston, £2.70 from the centre of town. There isn’t an Oyster card system so you have to have cash. They are quite empty, and because they move faster than London buses (less congestion), they are noisy! They do however come in fun colours, Arriva’s buses are turquoise-ish and cream usually, but I also boarded a red ‘United’ double decker this time, which is apparently a modern bus, repainted in celebration of 100 years of the company. Another bus has a huge painted zip on the side, half in red, half in Arriva’s modern colours. You can find out more here: http://www.arrivabus.co.uk/100-years-of-service/ which also tells you about a cool school project to collect stories and poems from the bus. 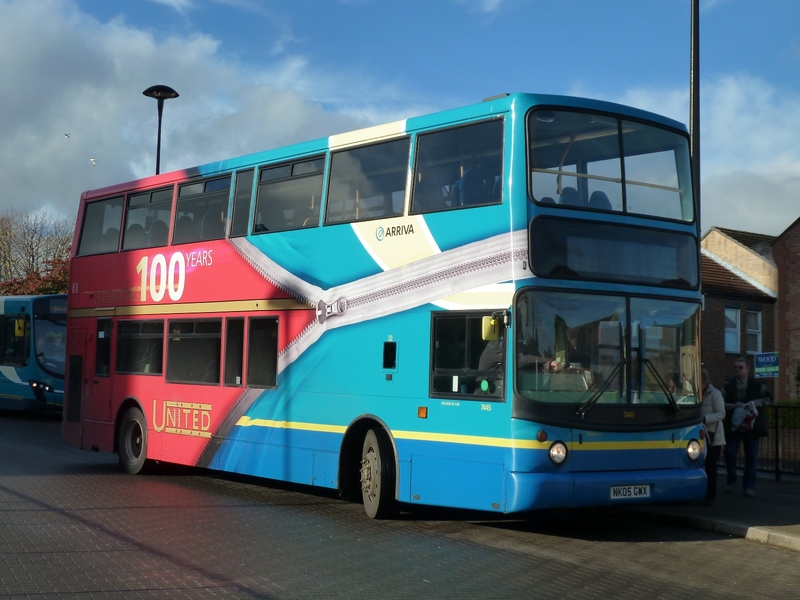 And shamelessly, I’ve nicked the photo from http://northeastbusnews.wordpress.com/. I have also been on a 10A from Ryton to Newcastle run by GoNorthEast (the northern version of Go Ahead London who run the 213 route). They come every 20 minutes even late at night and the driver let me change a tenner with him so that was good, even if the ticket cost over £2.50. Did you know that Britain (excluding London) is the only country in the world with an entirely privatised / deregulated bus service? More to come on that once I’ve read up a bit.